Note: Apply with Mothers PowerBall Mini polishing tools, applicator pad or soft cloth. Got car care questions? We�ve got answers. Check out Mother's "How To" videos or find out more at Mother's Waxforum and Detailguide pages. A downloadable Mothers Detail Guide (PDF) is also available so you can print out the entire Detail Guide, or just the info you need to review while you're detailing your ride. 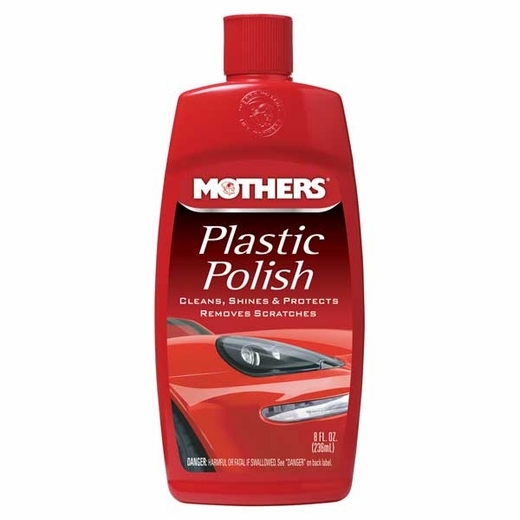 Bar none, Mothers Plastic Polish is the best plastic polish on the market. 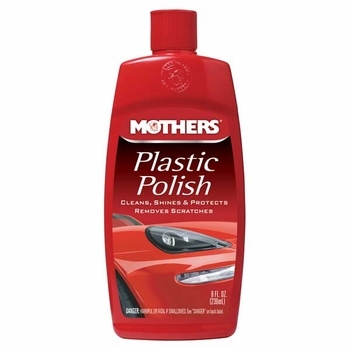 Whether it's your turn signal lenses, center caps, brake lights, convertible top window or the clear plastic gauge cluster cover, Mothers Plastic Polish will clean, shine and protect the clear stuff with crystal clarity. This is a true polish! You can buff out hairline scratches, smudges, flaws and little nicks, as well as clean away yellowing and stains from your plastic convertible window. Mothers Plastic Polish doesn't stop there! It protects your plastics from the sun, smog, water stains and airborne contaminants with a tough layer of polymers. Available here in a convenient 8 ounce bottle.